The crew of Coast Guard Cutter Ida Lewis discovered a buoy sunk in the water with bullet holes, Monday, near Block Island, Rhode Island. The crew was conducting regular aids-to-navigation maintenance when they approached Clay Head buoy number 7 and found it submerged. 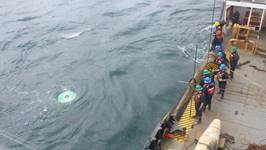 The crew raised the 12,000-pound buoy and found 20 bullet holes in it. Due to the extensive damage, this buoy was taken out of service for repairs. This aid to navigation marks a large rock three feet below the water's surface. Ferries transit this route frequently and provide critical supplies to Block Island. Buoy number 7 is supposed to be a key navigational tool for mariners and turned into a navigational hazard. This is the second aid discovered with bullet holes within a week. "While it may be fun to use a buoy for target practice, it is a federal crime," said Senior Chief Petty Officer Timothy Chase, the U.S. Coast Guard officer in charge of aids-to-navigation in the vicinity of Block Island. "Buoy number 7 became a navigational hazard that could have easily been struck by a vessel and seriously injured or killed mariners." Contact the North Shoreham Police Department at 401-466-3220 or the Coast Guard at 401-435-2351 with any information about this crime. 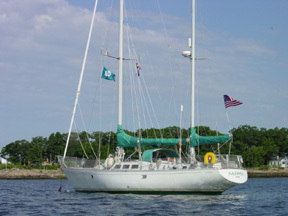 Coast Guard Cutter Ida Lewis is a 175-foot buoy tender homeported in Newport, Rhode Island. 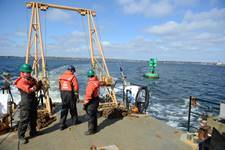 The crew services more than 200 buoys annually in southeastern New England.